Biking along the Mississippi River Trail, as it turns to the east in Granite Country, visitors can find many opportunities for fun memories that will last a lifetime when visiting the Saint Cloud area. Each year, thousands of people visit the trails and attractions of the area for good times, bustling nightlife, amazing arts, and the natural beauty and recreation you’d expect from a Mississippi River town. 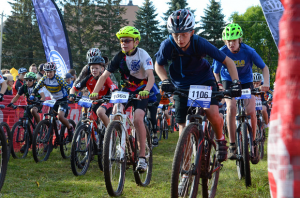 With a long list of places to stay and fun activities here in this Central Minnesota community, you will find many bicycle riding options and fun things to do when not pedaling. Competition on the Jail Trail, near St. Cloud, Minnesota. Photo Credit from MN High School Cycling League. When not biking, the warm summer air welcomes good times with outdoor art fairs, restaurant patios, festival events, and water sports activities. In the Fall you can enjoy the colorful array of the fall foliage in 80 city parks, including the stunning Munsinger and Clemens Gardens. All the while you’ll find that local winery and brewery establishments will offer up the crisp flavors of the harvest. In between winter fat bike experiences or cross-country skiing on the local trails, checkout the dozens of art and theater options, including the legendary Paramount Theatre in the vibrant, historic downtown district. Spring flowers blooming in the parks and along the bike trails welcome another season and makes this place great to come back again and again. 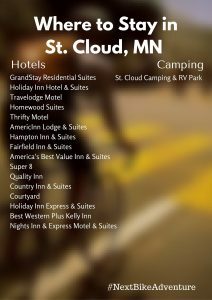 In a relaxing setting and comfortable riding environment, make sure to plan your next bike getaway with family and friends and go to Saint Cloud in Minnesota. Being a bike-friendly community, by the League of American Cyclists, you will find riding the streets and roads here safe and relaxing. You will also find miles of paved trails nestled in Granite Country. For the mountain biker, no matter your level of expertise, many fun trails are offered. From Texas Roadhouse to Mongo’s Grill, one of the finest in the area, Saint Cloud offers several interesting and charming cafes, coffee shops, and ice cream shops ideally suited to a cyclist’s taste. Along with most hotels, coffee shops and restaurants having Wi-Fi availability, the public library is another good option when exploring Saint Cloud and needing internet access. Additionally, Saint Cloud State University has public Wi-Fi available as well.